Ten-man Rovers were defeated 2-0 by Fleetwood Town at Highbury Stadium on Bank Holiday Monday. In an even first-half, both sides had limited chances on goal. Ollie Clarke tested Alex Cairns from range, as Ashley Hunter forced Sam Slocombe into action to tip wide a powerfully struck free-kick. 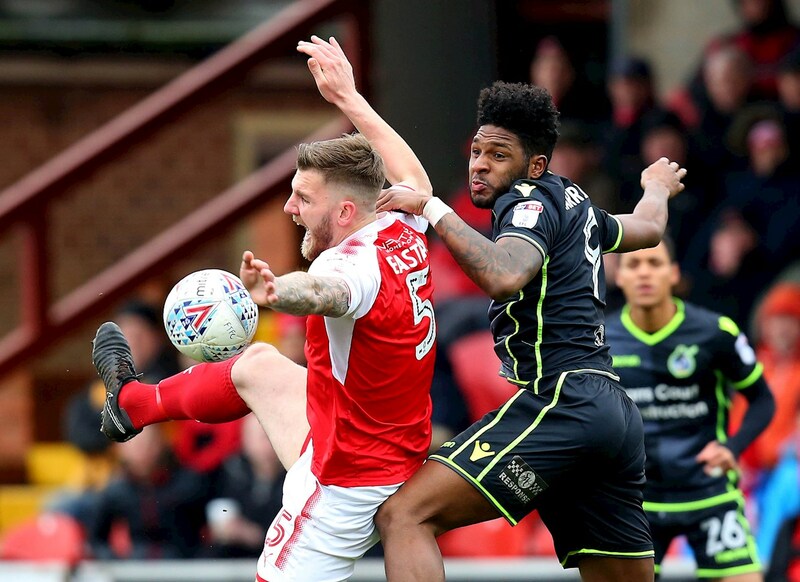 In the early period of the second half, Rovers were reduced to ten men in the games real talking point, as Chris Lines was dismissed for two cautions in as many minutes – as Fleetwood scored twice in the closing quarter of the game to register the win. Heading into the encounter, Rovers boss Darrell Clarke opted to make two initial changes to the starting eleven that faced Bury just three days prior. Into the starting line-up came Lee Brown and Byron Moore, as Marc Bola and Bernard Mensah missed out. There was a need for a further change as kick-off approached, as an injury in the warm-up led to Tom Nichols missing out, as Dom Telford was drafted in as a late like-for-like change. Fleetwood, on the other hand, remained unchanged, as John Sheridan elected to name the same starting eleven for the fourth straight fixture in a row. Rovers looked lively in opening exchanges and were able to exert a spell of early pressure on the hosts. Kyle Bennett looked primed to test Alex Cairns after breaking into the Fleetwood area but shifting the ball to right-footed after cutting inside the forward could only direct a miscued effort wide of the mark. Ten minutes into the encounter, Paddy Madden took sight on goal with a volley that curled in from the edge of the Rovers area, as Sam Slocombe had to touch the ball behind for a corner; Madden’s attempt looked like it may creep under the crossbar, as Rovers dealt with the resulting corner. At the other end, a sweeping cross from Lee Brown fell into the path of Dom Telford, but the striker couldn’t stretch to ensure a full connection with his first-time volley and the ball ended up being gathered gratefully by Cairns. The home side took full advantage of set-piece from twenty-five yards out midway through the first-half, as Ashley Hunter managed to force a powerful effort around the Rovers wall, but Sam Slocombe was again alert to tip the ball around the upright after diving at full-stretch to his left to deny Hunter. The combination of Telford and Harrison up front kept the Fleetwood defence occupied, as a rushed clearance from Cian Bolger almost fell kindly to the feet of Harrison, but Bolger’s mistake went unpunished as Paddy Madden was able to head the ball away from danger. The half-chance for Harrison was quickly succeeded by an effort from Byron Moore that just climbed over the crossbar from the edge of the Fleetwood area after the ball had settled nicely for the winger to shoot at goal. Rovers continued to build momentum, as Ollie Clarke ventured on a winding run forward before sliding a pass to the feet of Ellis Harrison, who saw his driven effort held on the ground by Cairns. There were more injury woes for Rovers as the first-half progressed, as Joe Partington was forced off on the stroke of thirty minutes and was replaced by Ryan Sweeney. The setback was met with an opportunity for Rovers to stake the first goal in the contest, as Ollie Clarke saw the space in front of him open up when adventuring into the final third and produced an accurate attempt on goal that had to be pushed wide by Cairns, who had to adjust his body to make the save down low from Clarke’s attempt. As the clock edged towards the half-time interval, a robust challenge from Toumani Diagouraga on Byron Moore after the winger had taken a touch to control a high ball had both sets of players infuriated and led to Diagouraga being the first player to handed a yellow card. Following the break, Jack Sowerby took aim from distance and sent his effort from range well over Sam Slocombe’s goal and at the other end, an inviting cross from Lee Brown narrowly missed the run of Dom Telford at the far-post. 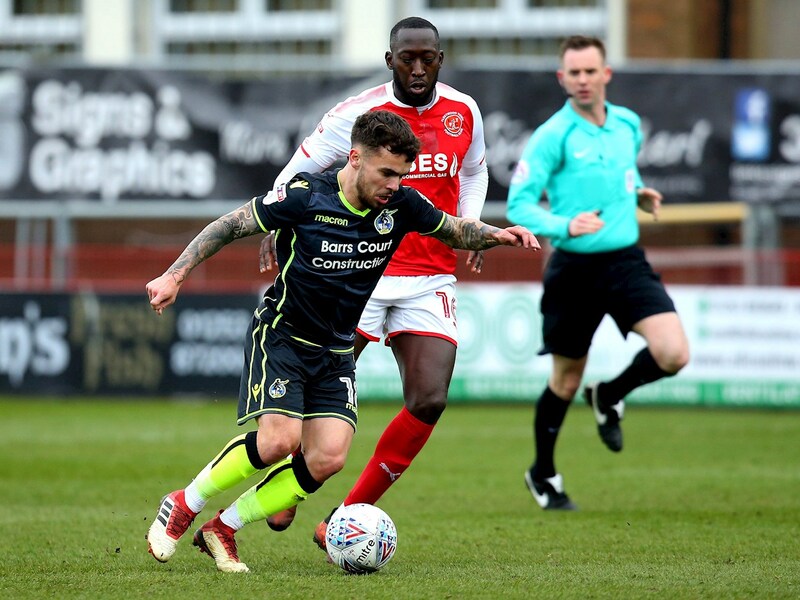 Rovers were then reduced to ten men, as Chris Lines was shown two yellow cards in the space of two minutes, as the midfielder was twice cautioned for dissent, leaving Rovers to face the final thirty minutes of the contest with a numerical disadvantage. Darrell Clarke responded by introducing Luke Russe from the bench, as Dom Telford made way for the youngster, as moments later, Rory Gaffney replaced Byron Moore. With the man advantage, Fleetwood enjoyed the majority of possession, but an organised approach from Rovers limited the chances for the home side. Paddy Madden did manage to navigate his way through a congested area to meet a cross from the right, but could only glance a close-range header into the arms of Sam Slocombe at the near post. Slocombe was again called upon moments later, as the goalkeeper pushed an attempt from Kyle Dempsey away from danger, as the rebound fell to Lewie Coyle, who fired his first-time attempt wide. Fleetwood then marked the opening goal of the contest, as the ball broke to Ashley Hunter in an advanced position on the left-wing. 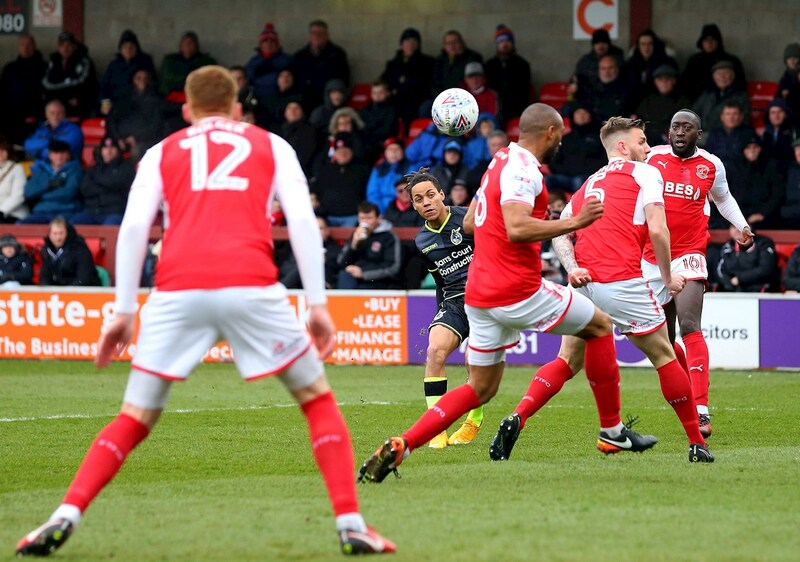 The forward cut inside and placed a shot across the face of goal that curled out of reach of Sam Slocombe, as Fleetwood edged ahead with a little over ten minutes remaining. The response from Rovers was a positive one to going behind, as they could have levelled the encounter in the seconds after Hunter’s goal. The ball broke to Ellis Harrison on the far reaches of the Fleetwood penalty area, as the striker turned and struck a snapshot towards goal that bounced back off the crossbar, with Ollie Clarke narrowly missing the opportunity to head home the rebound. As stoppage time approached, Jordy Hiwula extended Fleetwood’s lead, as the substitute slotted home past Sam Slocombe after being played in by Bobby Grant. Rovers XI: Sam Slocombe (GK), Joe Partington (30′ Ryan Sweeney), Tom Lockyer (c), Tony Craig, Lee Brown, Ollie Clarke, Chris Lines, Byron Moore (69′ Rory Gaffney), Kyle Bennett, Dom Telford (59′ Russe), Ellis Harrison. Subs: Adam Smith (GK), Ryan Sweeney, Cameron Hargreaves, Luke Russe, Bernard Mensah, Rory Gaffney. Fleetwood XI: Alex Cairns (GK), Lewis Coyle, Ashley Eastham, Nathan Pond (c), Cian Bolger, Ashley Hunter, Kyle Dempsey, Conor McAleny (67′ Jordy Hiwula), Toumani Diagouraga, Paddy Madden (82′ Wes Burns), Jack Sowerby (73′ Bobby Grant). Subs: Chris Neal (GK), Jordy Hiwula, Wes Burns, Bobby Grant, George Glendon, Gethin Jones, Harrison Biggins.